While CT is the favored imaging modality in the evaluation of upper urinary tract obstruction, other radiographic tests also have indications in the acute setting. For pregnant patients, abdominal and/or transvaginal US or less commonly MRI remain important tests for evaluation of urinary obstruction. Renal US, in particular, is also more commonly ordered as a first-line test in the pediatric population. While US does not provide the anatomic detail of CT or MRI, parenchymal abnormalities such as pyelonephritis, hydronephrosis, and stone disease can be detected quickly and fairly reliably without concerns about radiation exposure or contrast-related complications (Gulmi et al. 2002). Furthermore, US does further evaluate the character of urine in the obstructed upper urinary tract. Sedimentation, for example, may be visualized with US and this can provide additional evidence for pyonephrosis and would lead to more urgent need for drainage. In addition, findings noted on US can often help determine the duration of the obstruction. 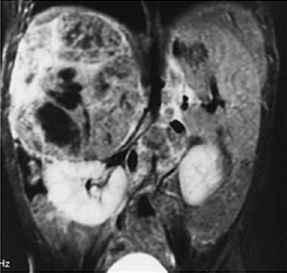 Long-standing obstruction can frequently be associated with thinning of the renal parenchyma. A common scenario is the presence of chronic obstruction related to stone disease or stricture with the appearance of a kidney that has extremely thinned renal parenchyma. The degree of observed hy-dronephrosis on US, however, is not as reliable when evaluating for duration of renal obstruction. Completely unobstructed upper urinary tract systems can show pyelocaliectasis, ureterectasis, or hydronephrosis that can be related to congenital variation (e.g., prune belly syndrome, megacystis/megaureter syndrome), lower urinary tract obstruction (e.g., urinary retention secondary to benign prostatic hyperplasia or urethral stricture), or reflux. In cases of dehydration, very early obstruction, or intrarenal collecting systems, US may also miss a diagnosis of upper urinary tract obstruction (Gulmi et al. 2002). To increase the sensitivity of US, a renal resistive index (RI) may provide important diagnostic information (Oktar et al. 2004). As initially described, a RI above 0.7 is defined as obstruction, yet underlying medical renal disease can be associated with RI values over 0.7 in the absence of renal obstruction. Because of this finding as well as the finding that renal obstruction can occur with RI below 0.7, use of RI in the diagnosis of failed upper urinary tract drainage is controversial (Gulmi et al. 2004). Indeed, US findings should be considered in context with other presenting clinical factors to arrive at the di agnosis of obstruction. Shokeir and co-workers recently reported, for instance, that renal RI measurements correlate positively with serum creatinine values in the setting of obstructive anuria (Shokeir et al. 2002). In addition, the group found that RI significantly improves after obstruction is drained and that rapid improvement in RI can predict early recoverability of renal function. At 3 days following drainage, however, the mean renal RI among the 48 treated patients remained at 0.70, a value classically associated with obstruction (Shokeir et al. 2002). Given such reported inconsistencies in the use of renal RI measurements and the concern with false-negative US findings for obstruction, a lower threshold should be made for obtaining additional diagnostic testing to evaluate for obstruction.